The Starr Ridge Vineyard, owned by our close friends the Baker Family, is the warmest of our Pinot Noir sites. Being north of the transition where the Russian River turns west toward the Pacific Ocean, it has a more diffused nature to the fog and reaches temperatures a couple of degrees above those of our own Soul Patch vineyard most days. It's a very slight difference but added up over the 240-day growing season, it is just enough to give a unique and luscious mid-palate and darker red fruits than the other single vineyard bottlings of Pinot Noir that we produce. Prince of Pinot - 92 pts. Starr Ridge Vineyard is a 20 year old vineyard in the Windsor Hills subregion of the Russian River Valley. The soils are from the ancient Franciscan series, with heavier decomposing volcanic rock and clays rich in iron. 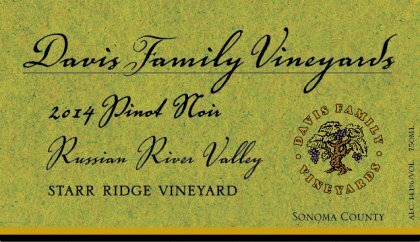 The Pinot Noir from this site achieves "the best of both worlds" – great richness from the site's warmer location, and a sensual finesse due to the cooler, eastern facing exposure. Guy tastes through and then hand selects his favorite barrels for the single vineyard bottling of the Starr Ridge Pinot Noir. The remaining barrels are then used in our Russian River Valley blend.